Is it Time for a Brake Pad Replacement? Brake pads sit between the calipers and the rotors. When you push on the brake pedal, the calipers on the pistons engage, squeezing the rotor. This results in a lot of friction, which the pads absorb. The pads preserve the effectiveness of your braking system, but they do tend to wear out over time. If you do a lot of city driving, stopping at stoplights or stop-and-go traffic, your brake pads will wear out faster. 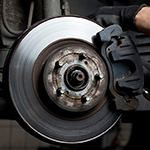 The lifespan of brake pads is three to six years, depending on your driving habits and the places where you drive. Signs they need replacement include longer stopping times and some squeaking as you stop. Our associates at Ferrari of Austin are ready to handle all of your automotive service needs, including brake pad replacement. Stop by any time for assistance.